As you feel the warmth of the sun setting in Anguilla there is a natural desire to wet your palate with the most exquisite of tastes. Whatever your preference, a full-bodied Merlot or a light and crisp Pinot Grigio, your taste buds are invigorated. What better way to wind down from a long day of sunbathing and swimming then to sit back, relax, and enjoy the vibrant colors of the sunset with your favorite glass of wine in hand. A 6-bedroom villa suited for wine aficionados, Moonraker Villa in Sile Bay, Anguilla awaits your arrival offering the greatest of amenities. 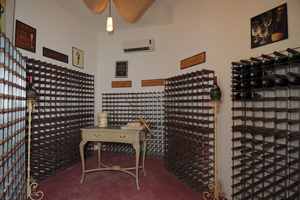 With a fully air-conditioned and temperature controlled wine cellar, your glass will always be refreshing. Whimsical in its décor, the wine cellar offers endless space to ensure a fabulous selection of wines. Send your own collection to the villa or inform the villa staff of your preferences so the wine cellar can be stocked prior to your arrival! For those looking for a wine to celebrate Anguilla and the brilliance of the Caribbean, try a Tropical Riesling. This refreshing fruit-infused wine features an array of tropical fruits. The perfect wine to cool you off after a day’s worth of digging your toes in the warm sand under the Caribbean sun. 2008 Hagafen White Riesling Lake County – This White Riesling presents aromas of peach, apricot, and pineapple. This tropical wine fills the mouth with a fusion of peach, apricot, and papaya.